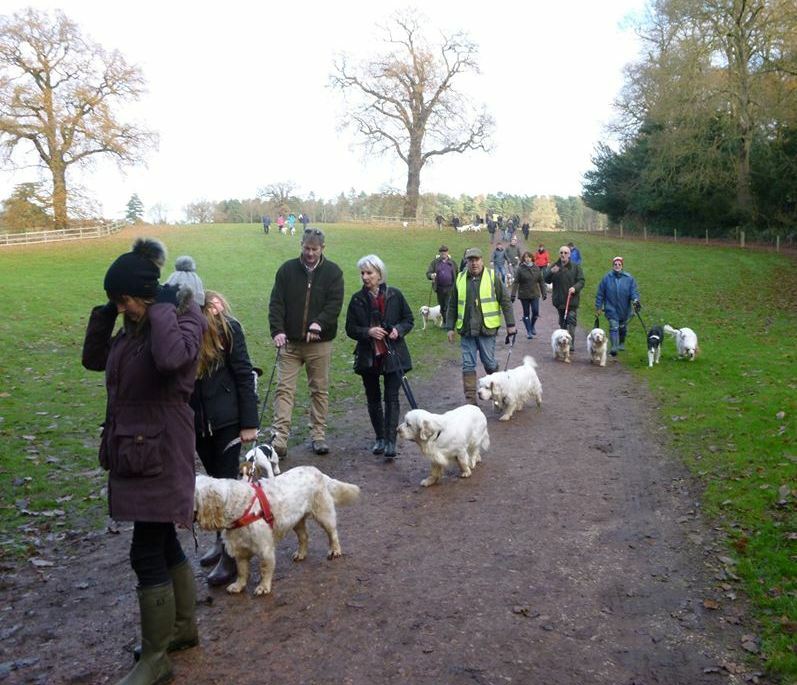 Clumber Walks began in 2015 as a way of bringing together pet owners who might seldom if ever meet another Clumber Spaniel. They provide the chance to swap stories, ask advice and just enjoy being with a group of people who all appreciate our lovely breed. One of our walkers said it was “the first time Archie had met another Clumber since we got him”. They are social and informal events which start by meeting at a cafe, then we spend an hour or so walking and then return to the cafe for optional lunch. It is a real mood-booster to watch the dogs running around together as part of a Clumber pack, while you walk and talk with fellow Clumber obsessed people. All owners of Clumbers are welcome and they can bring dogs of other breeds who live with them. Most park authorities put a limit on the number of walkers and so we now ask everyone to formally register using the form available at the bottom of the page. We take bookings on a first come first served basis and will give priority to Clumber owners. The video below was taken by Jim Loughran at the start of 2016’s Clumber Park Christmas Walk, he has kindly given us permission to share it. If you would like to join in the fun of Clumber Walks keep an eye on the Walking with Clumbers Facebook page for dates of upcoming walks. The walks are normally held in Country Parks or National Trust Estates that have an adequate car park, a safe meeting point for walkers to wait for everyone to arrive eg a cafe that welcomes dogs and provides outdoor seating, and preferably a covered area in case it rains, and of course some public toilets. Where possible the walk will be on waymarked or officially recognised paths which offer relatively easy walking suitable for children and elderly owners. Where the route cannot avoid more hazardous areas, you will be warned at the time you enrol on a walk. Walks will be planned to allow those with a young puppy or elderly dog to return to the car park after a short distance appropriate to the age of the dog. 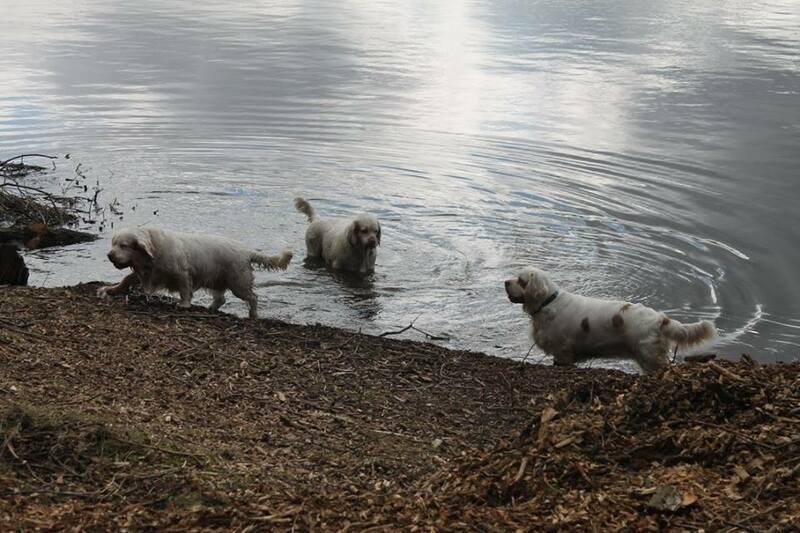 Most of our walks include a river or lake which is accessible to dogs, to provide a chance for the dogs to drink and an opportunity to get wet, swim or wash off the mud as appropriate. 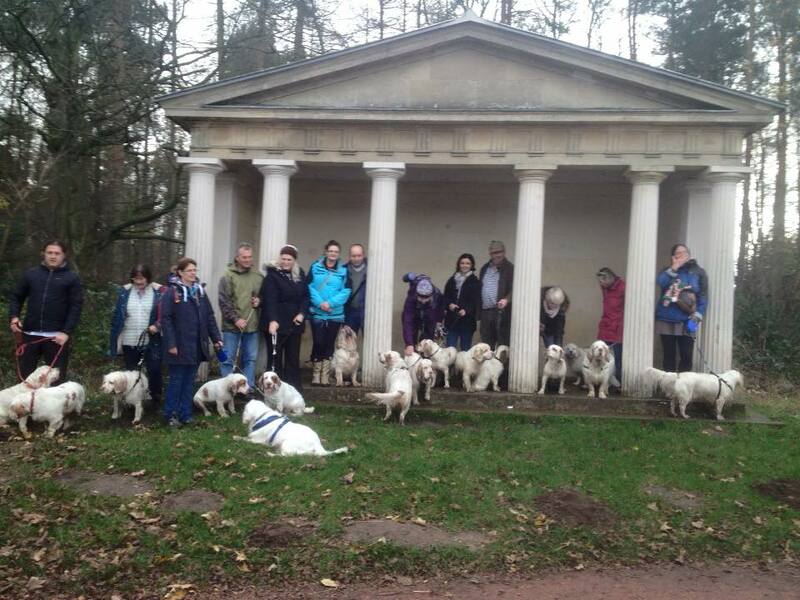 The walk programme usually includes a summer and Christmas walk at Clumber Park, the historical home of the Clumber Spaniel. Suggestions for new venues are always welcome. These walks are led by approved members of the Clumber Spaniel Club and are held under the banner of the Club so that the event is covered by their Public Liability and other insurance.All Clumber owners can join our walks, although we do ask non-members for a voluntary donation of £1 to help with the costs of the event or you can join the Club on the day. The form asks for the names of the dogs and humans who will be attending to enable us to prepare a Walk Register. We also ask for a mobile contact number so that if there are any last minute changes, or if you are late arriving for any reason, the Walk Leader will be able to contact you. All walkers are required to comply with our WALKERS CODE which can be downloaded from the link below. The management of most of the parks and other venues that we use for our walks require a Risk Assessment covering the risks to walkers and the public, and that the walk is covered by Public Liability Insurance. Some also require a detailed Code of Practice. Although a risk assessment is usually common sense it can be off putting. We have therefore drawn up a generic risk assessment covering the hazards that might be encountered on an organised walk, and then converted it into a series of more user-friendly ’Guides’ which provide more information about how we manage our walks.